This week Bloomberg’s Charles Penty and Angeline Benoit reported on Banco de España’s efforts to apply a waiver for capital deductions originating from Deferred Tax assets. Now, discussions on deductions from regulatory capital are often passionate – they consume lots of resources. This post argues that elaborate and detailed discussions on capital deductions are probably neither effective nor desirable. On the contrary, some deductions are not deductions at all and instead “help” the weaker banks by painting a deceptive picture of their resilience. Cruel to be kind? In particular the European implementation of Basel III, (CRR IV) wastes text on capital deductions. It devotes five articles on the definition of Common Equity Tier 1, the main positive element of regulatory capital. But then it spends 14 articles on refinements, of which some offer important waivers for these deductions. * These waivers weaken Basel III – and for that reason caused a lot of acrimony between the Basel Committee and the European Commission. An example of a Basel III deduction gone awry is the one requiring a bank to deduct from its regulatory capital the holdings in other financial institutions, such as holdings in other banks and insurance companies. When not included in a bank’s consolidated accounts, these holdings should be deducted from regulatory capital. This deduction makes sense. Without it, leverage and lending will spiral out of control. To illustrate: a bank with 10 euros to invest can invest one euro in the shares of another bank, and lend 9 euros to home owners. The other bank can invest that euro in again another bank, and lend 9 euros to other home owners. The last bank will repeat this trick, invest a euro in again another bank and lend 9 euros to even more home owners. We now created an imaginary system where a single euro supports at least 27 euros of lending. This is really bad! It creates a risk to the financial system. But, this risk can be nipped in the but by forcing banks to deduct their one-euro bank holdings from capital. Therefore, it makes sense to deduct holdings in financials. On this particular deduction, CRR IV basically takes the mickey out of Basel III. Instead of offering a simple deduction rule, it uses Articles 43 to 49 to water the deduction down; tailoring and tinkering the rules to country-specific needs and qualms. In doing so, CRR IV may create conditions that we would like to avoid. I wrote “may” because we don’t actually know. To find out about deductions, I downloaded data on deductions and solvency for a paper that has just been accepted for the Australasian Finance & Banking Conference. I’m working on its revision, and will post the paper by the end of this week, but here is a preview of my results. Note, the data is from the pre-Basel III U.S., and may be only indicative. However, I am convinced that Basel III won’t move my results dramatically, nor do I think that deductions work very differently in Europe. So how important are these deductions? To answer that question, I use data from U.S. bank holding companies for the graph below. The graph plots the distribution of the Tier 1 leverage ratio – in blue – and a measure of accounting solvency (in red: Equity divided by Total Assets) for a large U.S. sample of bank holding companies over the years 2001-2012. The deductions are taken from accounting equity to determine the Tier 1 leverage ratio, they therefore show up as the difference between the two curves. The deductions are small! Equity (in red) and Tier 1 (in blue) behave almost alike. The max difference is 2% max. If we want to move to solvency levels of 30%, that difference is close to a … rounding error. The deductions are actually not always deductions! 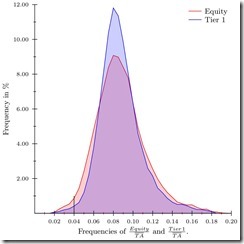 If the deductions were truly deductions, then the blue Tier 1 distribution would be a copy of the red distribution of Equity, but shifted to its left. Instead, the distribution of Tier 1 capital and Equity have the same means, the former is only more peaked than the latter. Therefore, contrary to customary use of the term “deductions”, these “deductions” apparently also increase regulatory capital. This is because some items increase Tier 1 capital, items such as net unrealized losses on available-for-sale securities and net losses on own creditworthiness. The “deductions” help the weaker banks. The “deductions” increase capital for banks with low solvency levels. As the graph shows, banks with low solvency levels, say, at the 4% mark, have a Tier 1 leverage ratio that clearly overstates accounting equity. True deductions only kick in when banks have healthy solvency ratios. It is only the high solvency banks where the deductions do their work. But then again, but who cares about really solvent banks? It goes to show that tinkering with deduction rules and offering waivers creates options for banks to augment capital – especially when their solvency is poor. My take-away: policy-makes can continue to spend many more hours discussing deductions that are small and not even always deductions. Alternatively, they can make an effort to more effectively sort out troubled banks; it’s your call. Especially in the light of comments from ECB’s Yves Mersch (unscrupulously followed by ING’s Jan Hommen) this week, that show the lack of progress in augmenting European bank capital, I think spending any additional word on Spain’s DTA qualms is a pure waste of time and tax-payers’ money. *Articles 25-29 of the CRR define Common Equity Tier 1. Articles 36-49 are on deductions, of which Article 36 defines the main deductions. The next articles refine them or water them down. The relevant waiver for Deferred Tax Assets features in Article 39 2., which wants us to believe that there exist Deferred Tax Assets that do not depend on the future profitability of a firm. Your average auditor will laugh his pants down if he read this. But then again, this is Europe. Previous Post Like, it’s not that nothing has been done.